The clarity and brightness of the Pro Slim bring out all the details in your subject. It offers the best tradeoff between small diameter, length, and bright illumination. Most machined metal parts afford ample access for the Priceless Aviation Hawkeye Pro Slim borescope and mirror tube. Clearly see burrs and surface finish in bores and cross-holes. 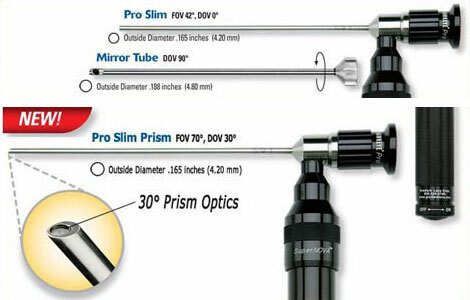 The forward oblique, 30° DOV of the all-new Pro Slim Prism delivers greater depth perception than either a 0° or 90° DOV scopes. Additionally, the wide 70° FOV gives the viewer a much broader and more versatile view of the subject. Priceless Aviation Hawkeye’s new prism optics represent our very latest optical design.